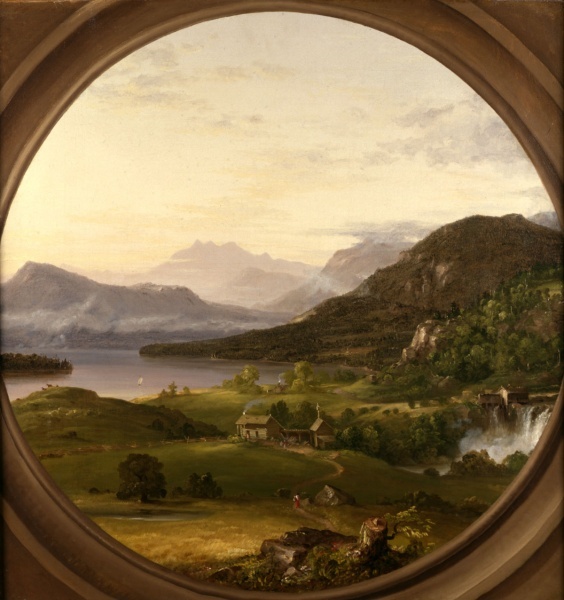 On June 24th, 1837 – that’s 174 years ago -- painter Thomas Cole visited Schroon Lake and made several drawings of the area, including what’s today known as Hoffman Mountain. It was his second trip in two years and he was moved to return after observing in his journal: “The [Schroon] Lake I found to be a beautiful sheet of water, overshadowed by sloping hills clothed with heavy forests”. It not only depicts a known site and its inhabitants but also conveys Cole's reactions to civilization's transformation of the wilderness. Look closely and you'll discover how rich in detail the painting is. You can you see a split rail fence, a sailboat on the lake and a person carrying a basket. Locations in the painting can be verified. The log house and nearby sawmill were owned by Joseph Richard’s built in 1798 on the falls of the Paradox Lake outlet. From a store attached to the house, Richard’s sold lumber. This domesticated scene underscores Cole's belief in the harmonious relationship between man and nature. The stump in the foreground signifies the taming of the wilderness; the rugged mountains and luminous sky in the background transcend mundane human occupations and embody Cole's belief that "Here we felt the sublimity of untamed wildness, and the majesty of the eternal mountains."